Grooming is an important part of caring for a dog. The Furminator DeShedding Tool is a great help in that department. This product makes removing loose hair from your dog a breeze. It also helps prevent tangles and mats from forming in your dog’s hair coat. These innovative, effective tools come matched to your dog’s size and hair length, with Furminator DeShedding Tools made for long-haired dogs and short-haired dogs of varying sizes. Be sure to choose the tool that best fits your dog. 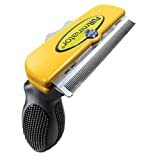 In my opinion, the Furminator DeShedding Tool is a grooming aid that is indispensable for any dog that sheds. Shedding is inconvenient for us, as pet owners, because of the hair that gets on our furniture, flooring and clothing. And for many of our dogs, if not groomed properly, tangles and mats in their hair can cause discomfort and even contribute to causing skin disease. This is particularly true for long-haired breeds. In addition, regular grooming can help your dog’s hair coat remain healthy and shiny. My staff at the veterinary hospital routinely demonstrates the use of the Furminator on our client’s dogs and clients continue to be amazed at the amount of hair removed by the product. Many of these dogs have been otherwise well-groomed and, in many instances, their owners don’t believe the dog has any loose hair to be removed until shown how the Furminator DeShedding Tool works. I’ve yet to receive any complaints from any of my clients that have purchased a Furminator to use on their dog and we have countless dog owners that are now using them. Keeping your dog well groomed is probably one of the most important things you can do (in addition to a good diet) to promote healthy skin and a good hair coat for your dog. The Furminator DeShedding Tool is well suited to the task. Anyone with a dog that sheds will benefit from the purchase of a Furminator DeShedding Tool. The tool is particularly useful for heavy-coated breeds that tend to “blow” their coat in the springtime. It is also well-suited to dogs with hair that tends to snarl or tangle easily. By reducing shedding up to 90%, the FURminator® deShedding Tool enables you to share your home with your dog, without surrendering it to his hair. The NEW Long Hair deShedding Tool for Toy Dogs is specially designed for dogs that are less than 10 pounds with hair that is longer than 2 inches. The long hair stainless steel edge reaches deep beneath your dog’s long topcoat to safely remove undercoat and loose hair, The FURejector button cleans and removes loose hair from the tool with ease. Nothing reduces shedding like FURminator deShedding Tools. New long hair stainless steel edge reaches deep beneath your dog’s long topcoat to safely remove undercoat and loose hair faster and easier.. Sleek, ergonomic handle makes the tool easy to grip. FURejector button cleans and removes loose hair from the tool with ease. No rake, brush or comb comes close. Now deShedding Tools are precision-designed for every pet size and hair length for faster, more efficient deShedding every time. Large is yellow and is for long haired dogs weighing 51-90 lbs. The 4″ edge is designed for coats longer than 2″. People love their pets but they hate the shedding. This tool pulls out incredible amounts of loose hair and undercoat without cutting or damaging the pet’s top coat. For Shampoo pet’s fur, or just to brush and remove excess hair. Find more FURminator deShedding Tool for Dogs products on Amazon!